Today, my work shift started late, so I woke up a little later than usual. The sun was shining, and as the rays of sun fell into my kitchen, I suddenly felt all cheerful. Soon, the leaves on the trees will start growing again, it will get sunnier and warmer. I kind of felt like I was coming out of hibernation and felt a sudden longing for dinners in the garden, fresh salads and fruits, barbecues in the sunshine and warm summer nights with friends and a bottle of prosecco. I know, I know...it's only early march, but spring is getting closer and I really love spring. I think it's my favorite season, the way friday night is my favorite night of the week. It's that satisfying feeling that you're done with the work week and the promise of two whole days off ahead of you. Spring, to me, is just like that. The dark days of winter are over, and the warm days of summer are just lurking around the corner. All of a sudden, I didn't want my usual breakfast of fried or scrambled eggs and bacon, but something more "summery". I whipped up some tomato-avocado salad, with a sprinkle of himalaya salt and some good olive oil. With it I ate a simple boiled egg and some smoked salmon. Now, how's that for decadence? 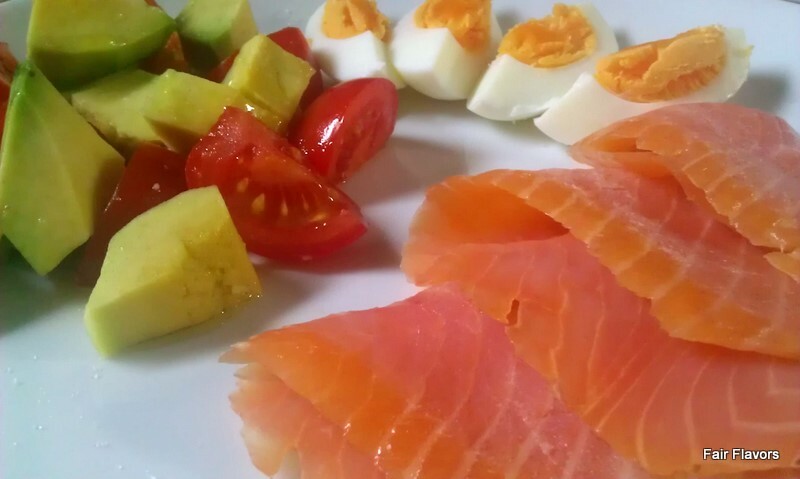 I have to tell you, a year ago, I would have never thought I would eat fish and salad for breakfast, but I love it! It made me feel refreshed all morning. After I finished breakfast, I had a mug of peppermint tea and I was ready for the day. And a bright day it was.